Innovations in dentistry are improving dental precision and making your appointments faster, easier, and more comfortable. Cutting-edge techniques are refining existing procedures and allowing for earlier, less-invasive treatment options. Dr. Leach is excited to bring all these new improvements to his patients. Call us today! One of the most exciting advancements to arrive in our office is digital X-ray technology. An image can be captured of your mouth with a digital sensor and downloaded right to our computer. We can also image your whole mouth in one shot, including your upper and lower jaws, using our panoramic digital X-ray machine. Dr. Leach is able to immediately begin evaluating the present state of your oral health, starting with your foundational bone structure. In addition, all the information is storable and can later be overlaid with more up-to-date X-rays to make your treatment progress more apparent. Not only does this technology extend more options than conventional X-rays, it does so while subjecting you to 75% less radiation than traditional captures, with no chemicals to pollute the environment. We want you to know we’re serious about sterilization. In addition to scrubbing and sterilizing all tools after every use, single-use options are chosen wherever possible. Instruments are sterilized after each use with our autoclave, which is regularly examined by an impartial lab to preserve the highest possible level of safety and cleanliness. Your well-being is too important to us to take even the slightest risk. As you make decisions regarding the next steps in reaching your dental goals, Dr. Leach wants you to have all the information available. To make this feasible, he uses a sophisticated tool known as the intra-oral camera. This innovative video system displays a close-up picture of the interior of your mouth, producing enlarged images on a display screen. Now, you can view what work needs to be completed and which teeth are doing fine. You’ll love how this works! 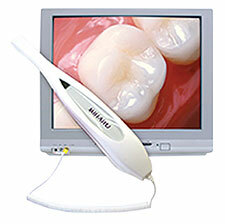 You’ll be delighted by the Cavitron Scaler™. In our practice, we use it to eradicate the buildup of plaque and calculus (tartar) from your teeth. This hand-held unit focuses high-frequency vibrations to enable us to strip deposits from your teeth quicker than with regular scaling instruments. It works especially well under the gumline and even in the deep pockets, which is often necessary for the management of gum disease. Not only will your teeth feel cleaner than ever before, but most of our patients indicate they experience less discomfort from the Cavitron Scaler. Nothing beats an easier, more comfortable dental visit. If you have questions about the latest dental technology, give us a call today at (423) 586-3432.